Updated Thursday January 24, 2019 by cvll. 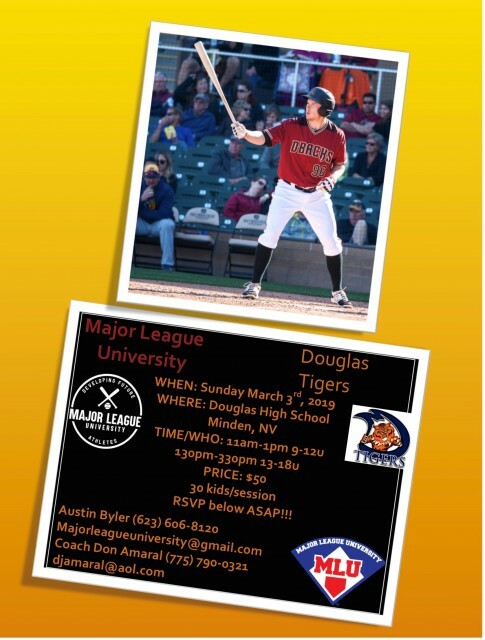 Austin Byler (past player with Wolfpack, D'backs and CVB coach) will be bringing his MLU program and team to DHS varsity field on March 3. He will be holding two sessions, 9-12 and 13-18 so they are age (and attention) appropriate. SPACE IS LIMITED TO 30 PLAYERS in each session. Please share this with your CVLL and CVB players and families. It's a great opportunity for them to learn or be reminded of the value of mental strength and how to apply it to their practices, workouts and play all while supporting the high school program! External links are provided for reference purposes. Carson Valley Little League is not responsible for the content of external Internet sites. Copyright Carson Valley Little League All rights Reserved.